Since I wrote about Crocs lightweight plastic shoes in 2007, there have been some developments. The original Crocs style sandal (Crocs Unisex Classic Clog) has been widely imitated and but have been banned in some workplaces for safety or style reasons. The company responded with new styles more like regular shoes. Crocs have proved very popular for those who have to stand up for long periods in the hospitality and health care industries. The waterproof plastic of the shoes makes them easy to clean. But the ventilation holes allowed material into the shoe, the low back left the heel exposed, they did not necessarily meet anti-slip standards and did not look "professional". So Crocks developed several styles of shoes with fewer (or no) ventilation holes, higher backs and soles which conform to anti-slip standards. These have no or one strap and some have decorative patterns. The Crocs Bistro Shoe has no vents and is claimed to be slip-resistant and tested to standard ASTM F1677. The most common colors for professionals are plain black or white. The Crocs Women's Mercy Clog is similar to the Bistro, but have a decorative band. The Crocs Tully Clog has one small row of round vents in the top of the shoe and no straps. 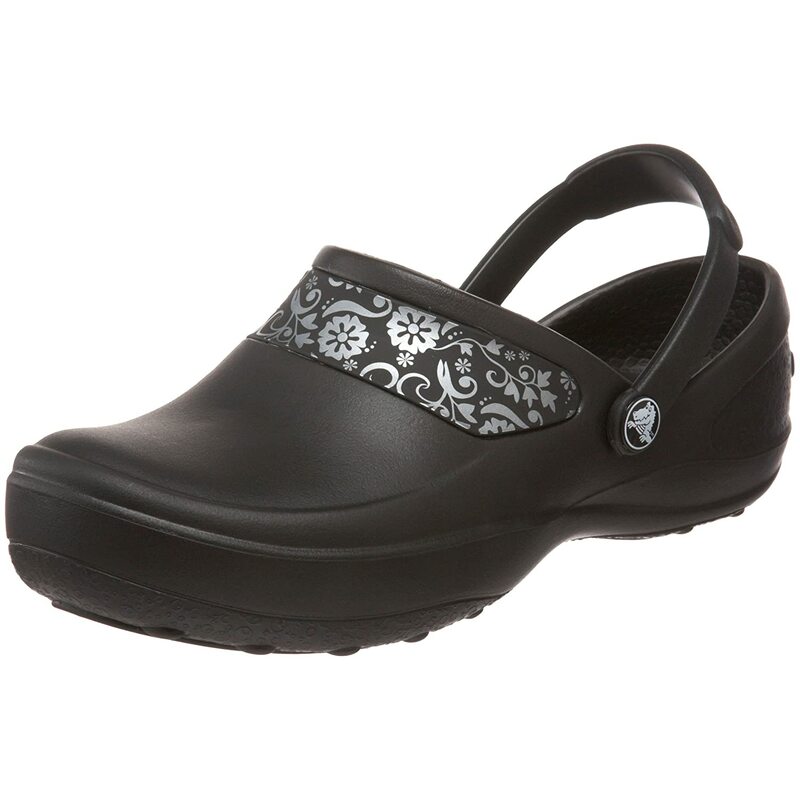 The Crocs Neria Work Clog has no vents and high back and also no strap. Before wearing any of these shoes in hazardous or work environments, you should check they meet local requirements. The plastic Crocs are made from is not heat, puncture or pressure resistant. A new pair of Crocs is reasonably slip resistant, but the tread can wear out quickly on a hard abrasive floor (such as raw concrete) making them smooth and slippery. Cleatskins are made from a similar plastic material to Crocs, but are designed to slip on over the plastic cleats of football boots and golf shoes (like galoshes), to allow them to be worn off the playing surface. For other sports there are a range of sizes and styles.